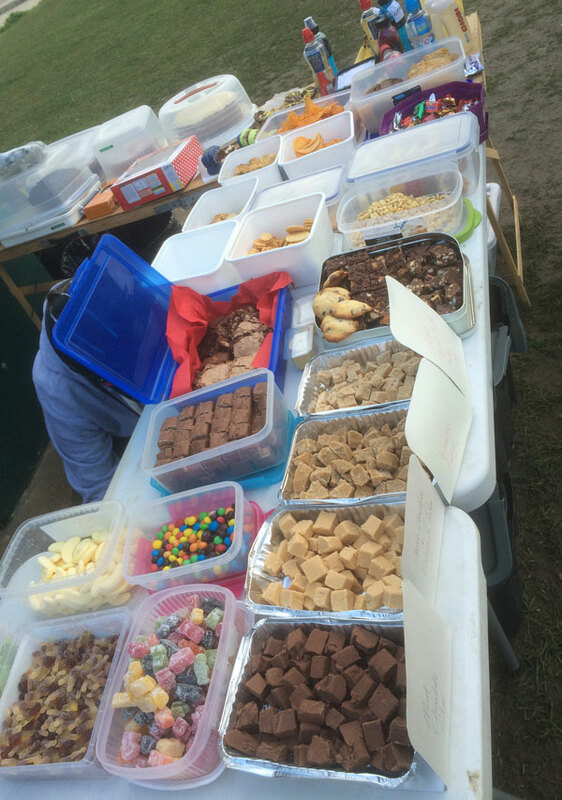 This is typical of the sort of aid station supplies that we have at our events. Note things like cake, cookies, fudge, crisps and chocolate and the absence of anything involving "isotonic" "gels" or "usual running stuff." We like our goodies when we run! We don't worry about the year badges at events that have a dated medal or ribbon of some sort, or marathon badges at marathons of course. Otherwise if you've reached one of these milestones let us know when you finish and we'll pin the relevant badge on your medal ribbon! We created (and now often imitated) the concept of runner friendly Challenge Events where runners can choose do what distance they wish within the type limits of the event. These are typically six hours or eight hours on hilly courses. A runner only needs to complete one lap to be an official finisher. We usually try to create loops that allow a runner to also finish a marathon type distance fairly closely. At the end of each lap a runner can choose to "ring out", ringing the bell to signify they are done for the day or carry on and complete another lap. If you complete over 26 miles then you're an official marathon finisher, over 27 miles then an official ultra finisher. (These are declared distances, not what it may say on a GPS device!). We've found this style of events are very popular as partners and friends can take part in the same event and complete different distances at different speeds, or runners can use them for "long runs" building up to marathon distance or just to run in a zero pressure friendly environment as there is no pressure to go fast or slow. Nobody minds how quickly or how slowly you go and indeed its very hard to figure out who is "first" or "last" and it really doesn't matter, the important thing being that runners enjoy themselves in a friendly environment. Would parents please note that we do not provide creche services for children nor is the base camp/start/finish area an entertainment area for children either. Please therefore do not leave your child alone in these areas for us to "keep an eye on" and don't let children entertain themselves around the runners, helpers and supporters. It may come as a surprise to some parents that runners with 20 or 30 miles on their legs actually don't enjoy stepping around children and we wish to maintain a safe environment for everyone and children in the vicinity of tired runners are both a hazard to themselves and to runners. We do allow children to take part in our events with the following conditions. 1) They must be accompanied by an adult at all times. Unfortunately you cannot run with dogs at our events. Running with dogs isn't included within the insurance coverage that we operate under and thus we can't allow this in case there is an incident or accident. Although a few events do allow these we do not. Firstly we simply disagree with them on principle, what event is an early start part of? Secondly it creates timing, logistical and safety issues, we're up early enough as it is on race days and it's unfair on helpers, volunteers, course markers and so on to be expected to be there even earlier, a six hour event can easily mean being on site for ten plus hours as it is. Thirdly, if you allow these things then events can quickly become farcical. If you have a one hour early start, people will start asking for two, a six hour challenge, becomes an eight hour one, then someone wants to start four hours early and so on. Events have clear start times and time limits, no early starts. We have a Facebook Group for runners to chat about SVN events. We're all grown ups so we're not going to police this hugely but please note any spamming, abuse or off topic things will likely just get deleted and/or earn people a ban. We're all just real friendly, low key any one who isn't will wonder where the group vanished to as we'll just ban/block and that'll be the end of it! Prior to the 2019 GFA requirements modifications by the London Marathon many runners had achieved GFA (even a couple of Championship Starts) at SVN Marathon events (Challenge events had never been usable as in the strict sense they are actually timed ultra runs). However for the 2019 (and onwards) London Marathon they are requiring that only times submitted from UKA Licenced Road Marathons can be used. The requirements for these are far too onerous for a small events company like SVN to accommodate, we like small, friendly events, not ones where we have to have race arbiters, race referees, lead bikes and everyone wearing day glow tabards. There are maybe 30 events in the UK a year that have a UKA Road Licence so hopefully for our quicker runners you'll still be able to earn those cracking times at those events! Please note we don't offer gluten free goody bags as an option. Gluten intolerance is a medical condition and we don't wish to warrant that items are gluten free. Now we're a firm believer in goody bags being actually full of goodies!if you find a bit of paper in there then its because somebody has asked to put something in there and we're doing it as a favour! 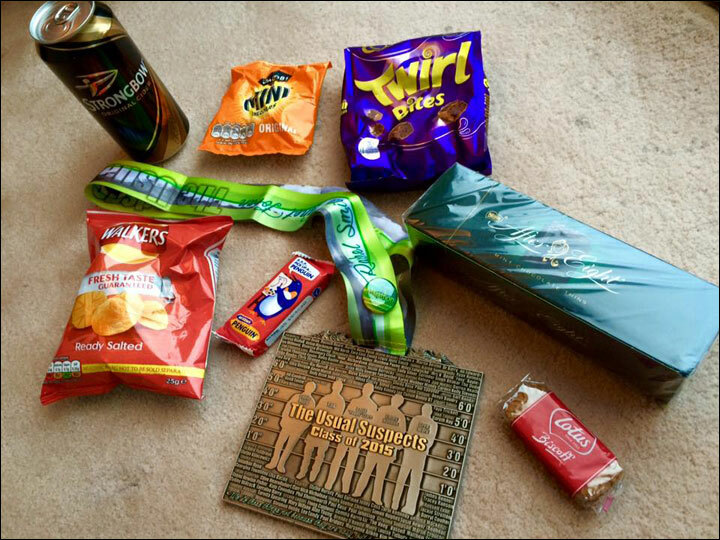 But we think that goody bags should contain the important "C's" of running, Chocolate, Crisps, Cheddars, Cider and Cookies and they basically just contain what I would like after every marathon. So there is nothing healthy, there are some savoury bits as sometimes I fancy those afterwards and then I most certainly fancy some "reward" chocolate so we have a lot of that. Our events are ones where you may not be losing any weight at! We sometimes get asked where the name comes from and its one that developed almost accidentally. 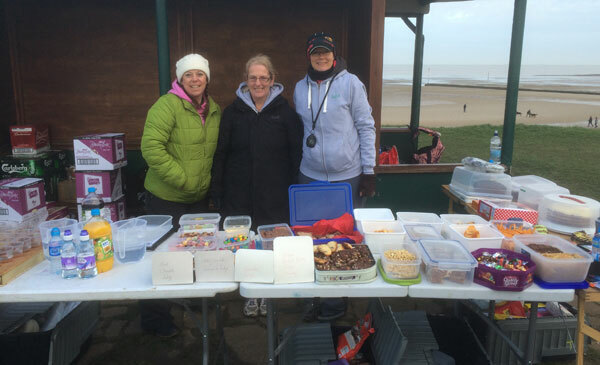 Our first event was the Saxon Shore Marathon and as we added other events around the Kent Coast we used other parts of the Saxon Shore Way and another sub section of it called the Viking Coastal Path so then we see a theme developing. Saxons, Vikings and frankly the Normans part isn't what you think at all! It's actually an "in" joke between Rachel and myself and I first suggested it be Saxons, Vikings and Norman, so people would wonder why there was just a singular Norman. It's all rather convoluted from a Monty Python sketch involving Spiny Norman... so anyway, that's where SVN came from, Saxons, Vikings and Spiny Normans! We have an SVN Strava group at https://www.strava.com/clubs/173587 if you'd care to join and see what other SVN runners are up to. Prior to Christmas 2018 we offered a vegan option for goody bags but this has never been widely supported, and as this creates the need for a completely separate set of shopping, storage, admin etc for just usually a small handful of runners we've decided to phase this out for events after Christmas 2018 and in to 2019. It's still our intention though to have a corner of the "picnic station" that is vegan friendly. We are phasing these out in favour of allowing more entries initially and allowing them to drift down in time as runners withdraw. If we are maintaining a waitlist for an event then this will be mentioned on the pages about that event and on the homepage informational box, if its not mentioned, then I'm afraid there isn't one! If we find that numbers have dropped sufficiently to allow more entrants then we'll open them up for entry again and announce this on our home page, facebook group and/or facebook page. Why are all your events different prices? Rather than have a "one size fits all" price we tailor each price to each event as a reflection of the actual costs involved and our biggest outlay by far is the medals, we do like our bling, so basically the more expensive events have the more expensive bling. Additionally the amount we donate to the nature reserves we use vary both by venue and by event, for example sometimes we have to cover the cost of a ranger being there early or late, other times we donate more because we're there for longer and other times we donate more because they've given us special permission to hold a certain type of event there and £7.50 per runner makes them happier than £5.00 per runner. We try to be fairly transparent, the amount of each entry fee that we donate is specified on the race pages, SVN then round up and cover the Paypal fees, typically adding an additional 5% or so to all the donations. Well basically that's me, Traviss and Rachel, I've run over 375 marathons and ultras, Rachel over 150.. SVN in many ways is our way of "giving back" to the running community, basically low key, friendly, logistically simple events for people to enjoy their running in a social environment.